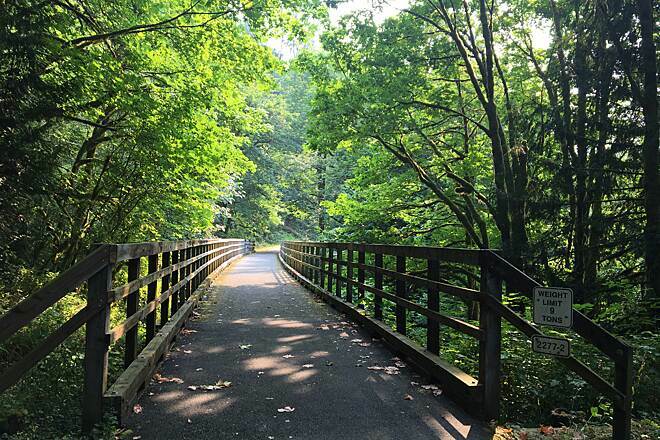 The 6.5-mile paved Preston-Snoqualmie Trail meanders through Snoqualmie Valley, with a short roadside section and crossing. 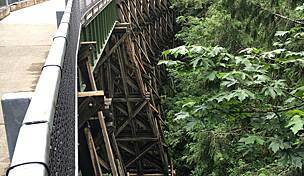 It crosses a set of unpaved yet accommodating switchbacks that replace a trestle from the old Seattle, Lake Shore & Eastern Railway. 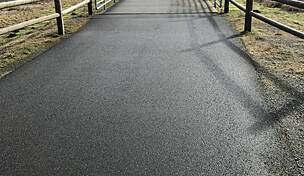 This inserts a brief walk that works fine with a road bike. 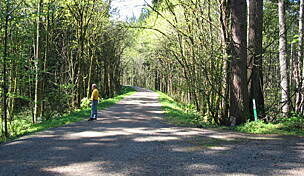 The main trail leaves the Preston trailhead on a gradual, steady coast to the Raging River Valley. Preston is a historic mill town named after railway official William Preston. 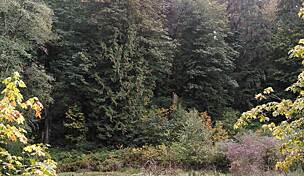 The area offers quiet distractions, such as an inviting grassy pullout and bench and a bridge, framed by evergreens and cedars above and the ravine below. 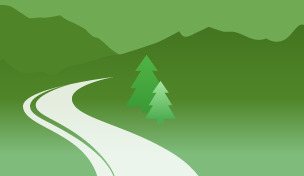 The trail grade increases and suddenly curves sharply, steeply, and briefly toward the road at 2.5 miles. A final leveling out allows a semicivilized descent. A crosswalk and sign guide you across speedy Preston–Fall City Road to one block of separated trail, which then takes you left onto SE 68th Street to a mossy bridge overlooking the river. This pleasant, short street rises to the road (with cement barriers for 0.25 mile). 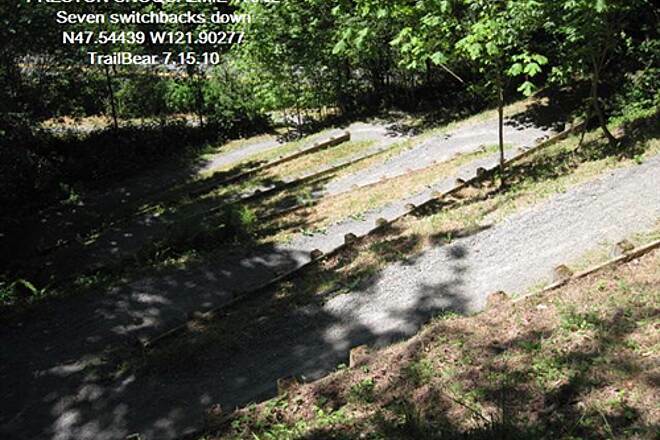 Abandon the road to welcome the attractive configuration of switchbacks. Climb 80 feet on grass and gravel to a well-placed bench. 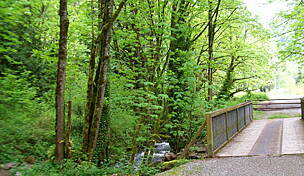 This older paved trail hosts a unique log chair and a bridge high above a creek. 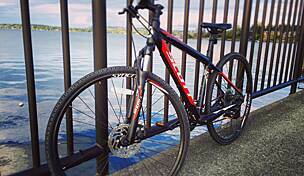 Next stop is the Lake Alice trailhead and picnic area at 3.5 miles. 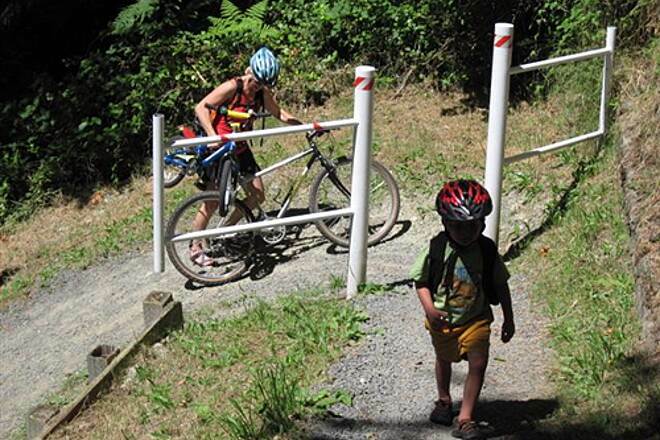 Parking at this trailhead offers a trip on a gentle, paved grade in either direction. From here, the trail continues 1.8 miles across Lake Alice Road. 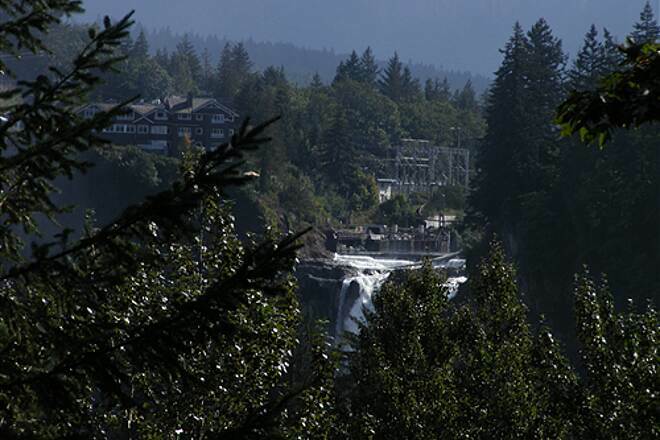 Three benches at the end of the trail provide the perfect spot to enjoy a densely framed view across Snoqualmie Falls and the river to the impressive Salish Lodge. The dense foliage of summer obstructs the view of the 270-foot waterfall, so you might want to check out this trail in fall and winter. 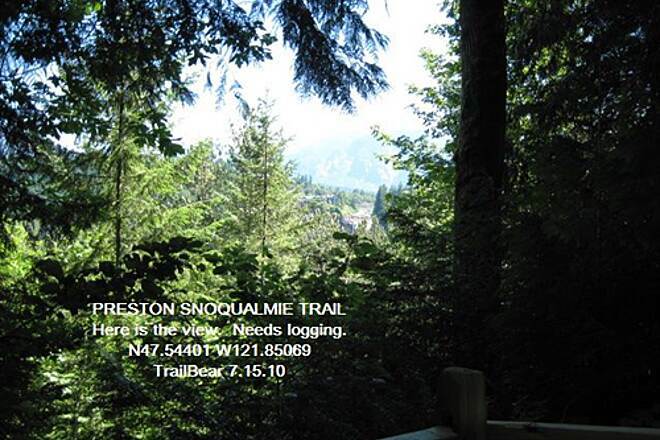 To reach the Preston-Snoqualmie Trailhead, take Interstate 90 to Exit 22. At the end of the ramp, head east; then turn right at the T onto SE High Point Way. After 0.4 mile, turn left onto SE 87th Place. To reach the Lake Alice trailhead, continue 3.5 miles past SE 87th Place on SE High Point Way, which becomes Preston–Fall City Road SE. Turn right onto SE 47th Street/Lake Alice Road SE; the parking lot will be 0.8 mile uphill on the right. The final 1.8-mile section begins across the road. 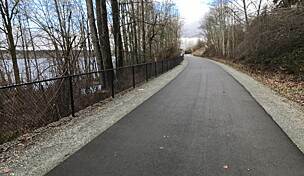 I have been on this trail two ways: by bicycle from the Preston trail head and ridden the 6.5 miles to the trail end south of Snoqualmie Falls; and by foot from my neighborhood near Tanner Jean Park in Snoqualmie Ridge. The cycling is good, even on a road bike if you don't mind gravel at the half-way point to climb the switch-backs (a mountain bike is preferable). 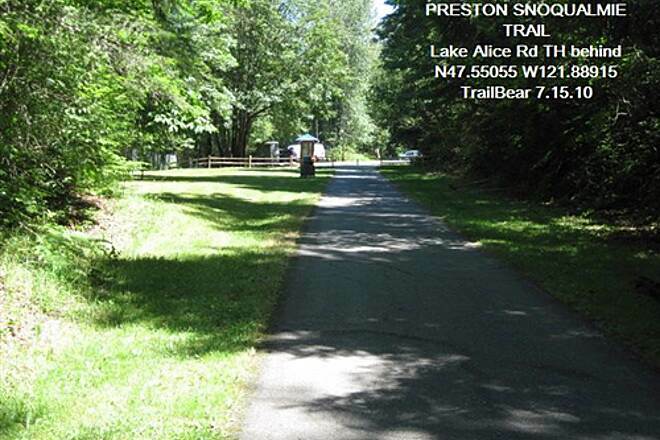 Easy trail, low traffic, just be careful crossing the Preston-Fall City road. Avoiding traffic by walking down Deep-Creek Trail from Tanner Jean Park (Azalea Park), is very relaxing and the trees provide excellent shade from sun on hot days. 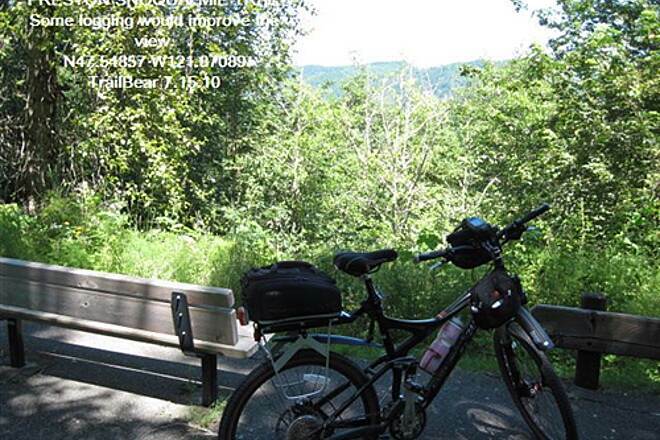 The Deep Creek trail intersects the Preston-Snoqualmie trail and you can follow it to the trail end. 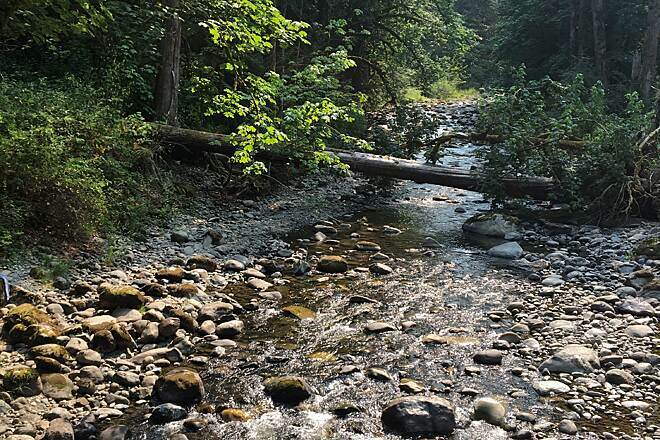 There are other trails to return to the Snoqualmie Ridge as well. I was visiting Western WA in December when it rains most days, so it was difficult to find a day when a trail walk might be enjoyable. However after 2 weeks of practically uninterrupted rain, the New Years Eve weather forecast was quite promising. As it turned out the promised sunshine only appeared for a few minutes, but nevertheless it was dry and clear. I like to walk from place to place, so left the car and took the bus to Preston, near the start of the trail. The dead end at Snoqualmie intimidated me, but the map showed it quite near to civilisation so I set out, hoping not to have to retrace my steps back to Preston. The first couple of miles were rather noisy, first from the I90, then the Fall City Preston Road. Then came the well publicised drop down into the valley which the railway used to cross by trestle bridge and the short but stiff climb back. Then the trail got quieter and there was more a sense of isolation. Past the trail head at Lake Alice Road a big sign warned of the dead end ahead. Reaching this there was the wonderful view of Snoqualmie Falls (the winter foilage not thick enough to obscure it), but the high fence and intimdating warning signs clearly prevented further progress. 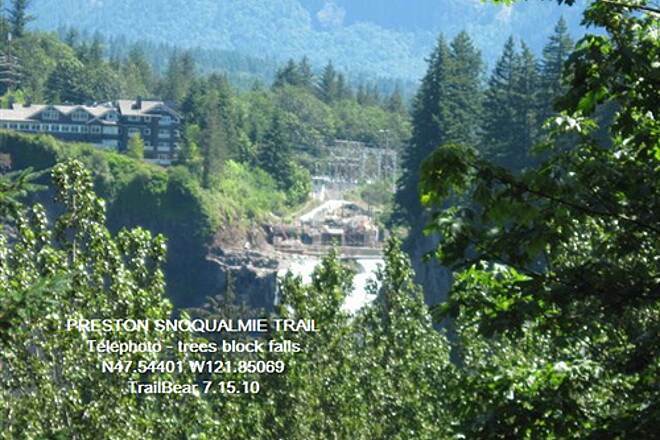 What a pity; who allowed the rail track to be snapped up by someone when the trail is so close to downtown Snoqualmie with rail museum and falls nearby? However, I did notice two small dirt trails going off southwards between the trail head and dead end. So I retraced to one of these; it turned out to lead to quite a network of trails without much trail marking. 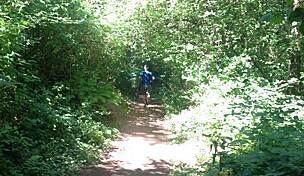 I found one going very steeply uphill and emerged in Denny Peak Park. Then followed quite a long traipse through an awful middle income housing development to the Snoqualmie Parkway which has a trail running by the side into Snoqualmie downtown where I only had a few minutes to tour the museum before the next bus back to Issaquah. This would be a much better trail if somebody could grab back that short section of former rails to the Snoqualmie River. How on earth was someboby allowed to take that over? Agree with everything TrailBear says. We rode this in June with 8-yo and 10-yo kids, and it was perfect. 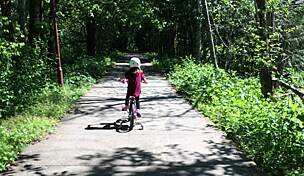 Mom and dad were riding mountain bikes with 1.5" slick tires, the kids riding with knobbies. Worked fine. The seven switchbacks were a pain, but so short that you can't complain. The trail is nice, clear, bounded by beautiful forest, and not at all crowded. Strongly recommended. 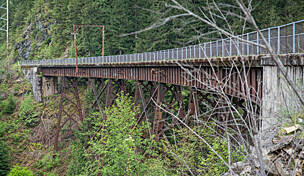 The Preston-Snoqualmie is two trails in one, separated by a deep ravine, the Preston-Fall City Rd. and the Raging River. (Yes, it does rage. Its personal best was +4,000 cubic feet/second at the gauging station.) The ride is mostly shaded with a good blacktop trail bed, some root heaves, and very little altitude change. That is, until you reach the abutment of the former trestle. On the Fall City side there are seven switchbacks which descent to the valley floor. Then, back up the other side. Walk this aerobic part. 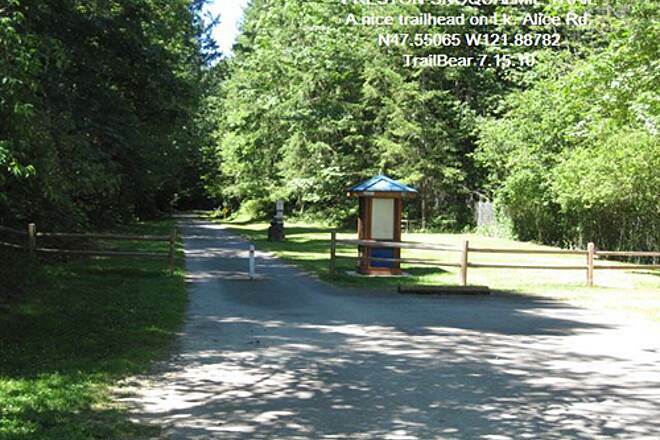 Here is a pleasant trailhead off Lake Alice Rd. with ample parking, a picnic table, info kiosk and portapotty. It also has shade, which TB enjoyed, parking his Sloth Chair in the shade and snoozing off his lunch. Then mount up and on the trail. The first leg was to ride out to the viewpoint. 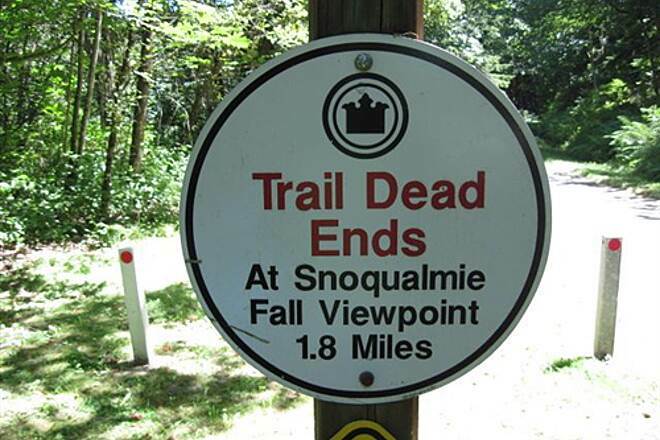 The sign says it is 1.8 miles from the trailhead. TB is skeptical of viewpoints in the NorthWet. Things grow too well here. All that water. Unless the land beyond and below is logged to keep the view open, the trees take over and farewell view. The power companies know how to do this. They cut every tree in their right of way and keep them cut. You can see things when a trail crosses a power line right of way. However, the photos always seem to include power lines. Not too much of a view; too many young trees. However, it is a nice wayside with benches and trash. For a real view, continue onward to where the power lines cross the trail. From there it is a half mile onward to the …. 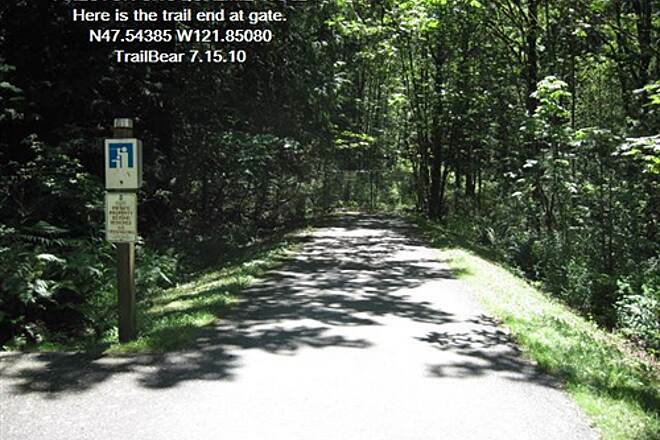 The trail ends here with a set of gates across the right of way and a lot of young trees growing up on it. If the trail did go through, it would switch back down the slope to the river and run up to North Bend along the highway. You can see bits of the track at the Northwest Railway Museum in Snoqualmie. 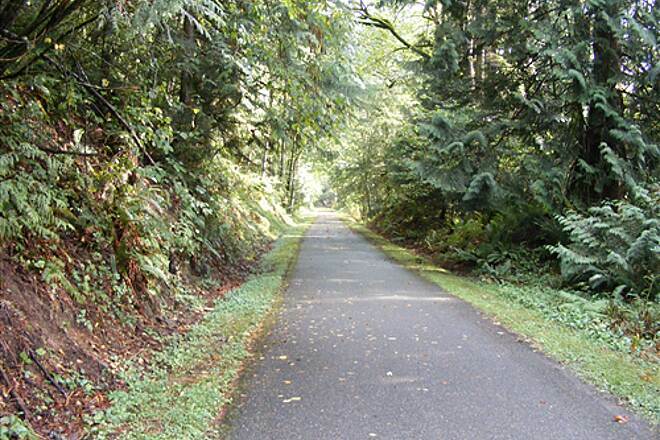 In North Bend the right of way merges with the Snoqualmie Valley Trail (former Milwaukee Road) and heads up to the John Wayne Pioneer Trail at Rattlesnake Lake. You take a short left from the trail and down to the overlook. There are three viewing benches and the trees have obscured the view of Snoqualmie Falls from two of them. You can still see a bit from bench #1. We really need a housing tract below the viewpoint on this slope. Snoqualmie Falls is quite impressive – and much more so in the Wet Season. Had enough viewing? Head back down the trail to the Lake Alice Rd. trailhead and beyond. Notice the two unmarked trails (covered in wood chips) which enter to the right side as you return. Both connect to the trail system out of Snoqualmie Ridge, just over the ridge. They have an extensive walking trail system. These two trails connect to the Deep Creek Trail, which runs along the side of the ridge. One leg up will take you to Azalea Park on the other side. It must have been an impressive trestle. There is a bench right at where the abutment once stood. 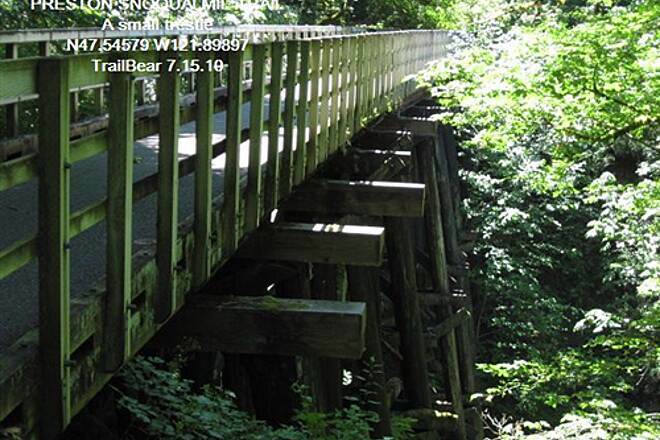 TrailBear has been on the web, looking for a photo of the trestle – but no joy. Notice the sign commanding: HORSE AND BICYLE RIDERS DISMOUNT. A hot mountain biker probably could ride it down, but those are tight switchbacks and the terrain is steep. Just the sort of thing that would appeal. Trudging up the switchbacks is mom, small daughter and smaller son. Mom is carrying smaller son’s bike and pushing hers. Daughter is doing OK pushing her bike. Very little whining. They just do it and gain the top and take a break. Nice to have a bench there. Nicer to have an ice cream stand. TrailBear leaves you at this point. The afternoon is HOT and TB wants his nap in the shade. So, back to the Lake Alice Rd. trailhead and some shade time. The trailbed gets an A. Smooth and no extreme grades until you hit the missing trestle. Root heaves in places. Facilities - C. Lake Alice Rd. is a decent dry trailhead. The one at Preston gets a B. It has water and flushies. Scenery – B. 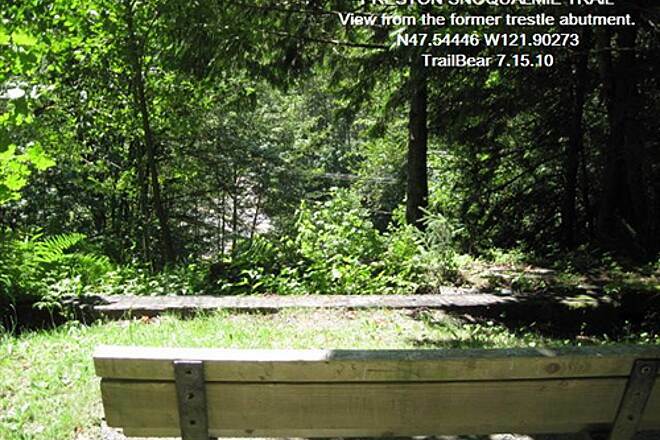 Lots of trees merits a C, but viewpoints and trestle are worth a B. The Snoqualmie Ridge section would work well with kids. No extreme terrain or distances. 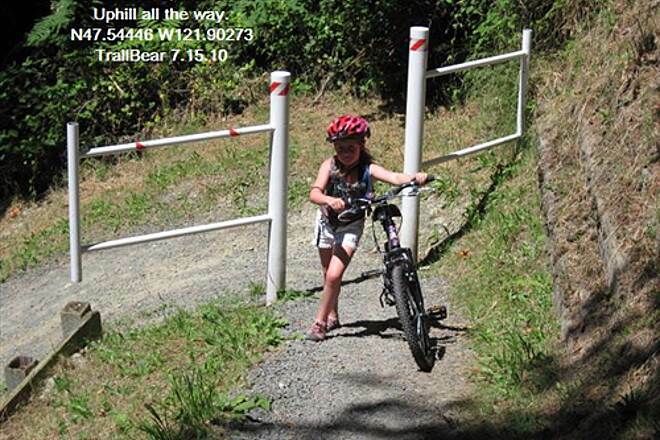 For larger kids, consider the switchbacks and the whole trail. It would be about a 12 mile out n back.